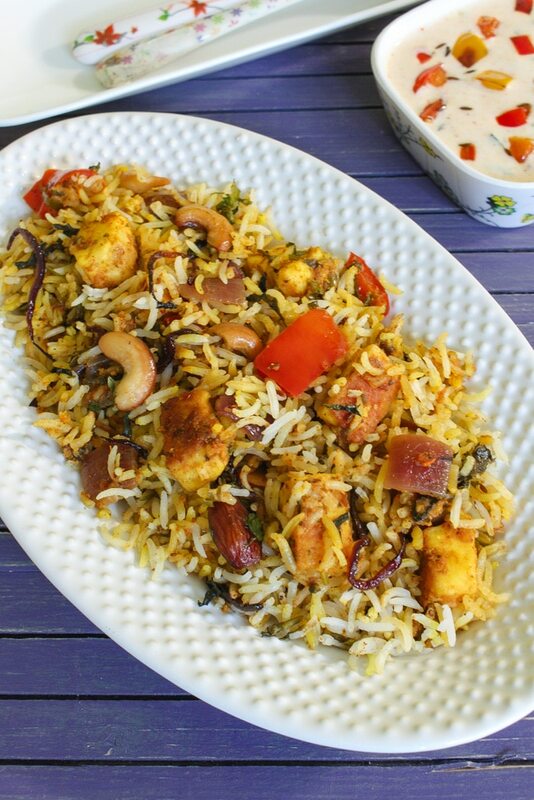 This paneer biryani is an incredibly flavorful and perfectly filling recipe. I am sure you’ll want this in your lunch/dinner menu again and again! It’s so easy to make and will be ready under 1 hour! This paneer dum biryani is one of those meals that everyone in the family can agree on. It is good for adults and kids since it is high protein meal and also delicious enough to satisfy your hunger. When you get a bowl of warm biryani and raita, it’s just straight up delicious cozy comfort food. The good thing about biryani dishes that it is made in big batch. You know you can’t make biryani for 2 servings. So you will have leftovers for lunch. I always love when I have lunches ready for reheat. There are many different verities of vegetarian and non-veg biryanis made. 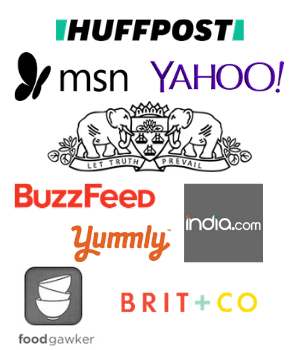 Few of them I shared here on the blog. As the name of the recipe says, it is dum cooked meaning everything is slow cooked together. This method of cooking gives very flavorful and aromatic results. Yum!! Every region has their own version of making paneer biryani where different spices and ingredients are used. 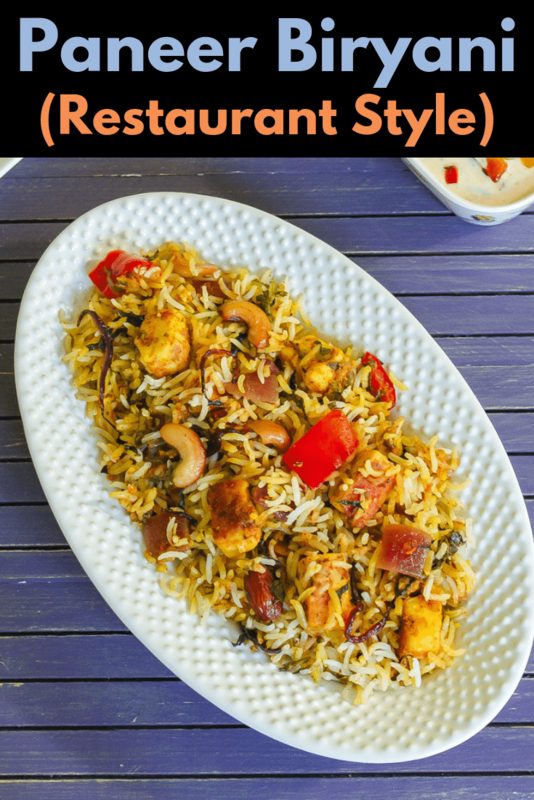 This is hyderabadi paneer biryani recipe which you always find in Indian restaurants. 1)Wash the rice under running cold water till water runs clear or rinse 2-3 times till water is not cloudy anymore. Then soak in enough water for 20 minutes. 2) To make paneer marinade, take yogurt, salt and all the marinade spices (turmeric powder, red chili powder, coriander powder, roasted cumin powder, fennel seeds powder, biryani masala, crushed kasoori methi) in a bowl. 4) Add paneer cubes and mix to coat the marinade to cubes. Keep it aside until needed. You can marinade ahead of time and keep in the refrigerator. 5) Now discard the soaking water from the rice. In a saucepan, bring water to rolling boil for cooking rice. Once it starts boiling add salt. 6) Then add whole spices (green cardamoms, black cardamoms, cinnamon stick, bay leaves, cloves, star anise). 7) Next add rice and cook for exactly 5 minutes. Rice should be only 80% cooked meaning it should be slightly raw. 8) Now drain the water using colander. Spread the rice in plate, so the grains stay separated. Discard the whole spices from the rice. 9) Now heat 2 tablespoons of oil a pan on medium heat. Once hot add cashews and almonds. Fry with stirring constantly till they are golden brown. 10) Then remove it to a plate by draining excess oil. 11) In the same oil add sliced onion to make birista. If using store bought fried onions then skip this step. 12) Fry till onions are golden brown in color. Be careful not to burn them. Remove it to a plate and keep it aside. 13) In the same pan, heat remaining 1 tablespoon of oil on medium heat. Once hot add cumin seeds and let them sizzle. 14) Then add onion, capsicum, ginger, garlic paste and green chili. Add salt to speed up the cooking process. Mix and cook for 3-4 minutes or till onions get translucent and starts to soften. 15) Then add tomato puree and stir well. 16) Cook till all the water evaporates. 17) Then add turmeric powder and biryani masala. 18) Mix well and cook for 30-40 seconds. 18) Now lower the heat and add marinated paneer. 19) Mix well, add ¼ cup of water and bring to a simmer. Now do not simmer for long time otherwise paneer will get tough and chewy. 20) Sprinkle half of chopped cilantro and mint leaves. 21) Then spread the partially cooked rice, drizzle cream+saffron mixture and then drizzle the ghee over the layer. 22) On top, sprinkle fried cashews, almonds, fried onion and remaining cilantro, mint leaves. 23) Cover it with lid or plate (thali). Put the weight on so steam cannot escape. Alternately you can layer aluminum foil between pan and lid. 24) Keep the gas flame lowest possible. And cook for 15-20 minutes. 25) When ready to serve, open the lid, lightly mix and serve. What to serve with paneer biryani? Serve a bowl of raita on the side. Few options are onion tomato raita, mint raita, boondi raita, spinach raita, cucumber raita. Also, have roasted urad papad on the side for some crunch. Even it tastes good without any sides. 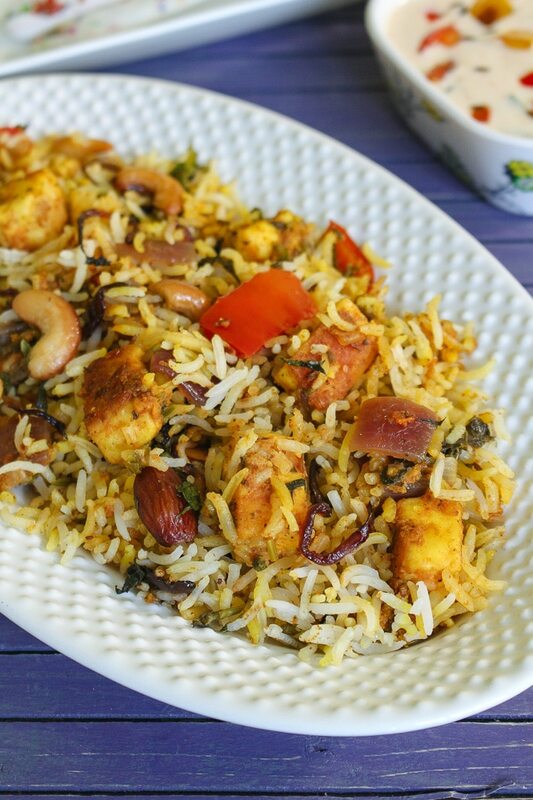 This paneer biryani is an incredibly flavorful and perfectly filling recipe. The layers of marinated paneer gravy, rice, cilantro, mint, nuts, saffron mixture, and fried onions are dum cooked. This slow cooking process makes it aromatic and full of flavors. Take yogurt, salt and all marinade spices in a bowl and mix. Add paneer cubes and coat them well and let it marinate for 15-20 minutes. Warm up the heavy cream or milk in a microwave or stove top. Add saffron strands and let it infuse its color and flavor. Bring the water to rolling boil on medium-high heat. Then add salt, whole spices, and rice. Cook for exactly 5 minutes or till rice is partially cooked only 80%. Drain the water, spread the rice in a plate and discard the whole spices. Heat the 2 tablespoons of oil in a pan on medium heat. Fry cashews and almonds in oil till they are golden brown. Remove it to a plate. In the same oil fry sliced onions till golden brown and remove it to a plate. Add remaining oil in the same pan. Once hot add cumin seeds and let them sizzle. Add onion, bell pepper, ginger paste, garlic paste, green chili, and salt. Cook till onions start to soften and become translucent. Add tomato puree and cook till all the moisture evaporates and becomes dry. Add turmeric powder and biryani masala, mix and cook for few seconds. Lower the heat and add marinated paneer and ¼ cup of water. Bring to a simmer. Sprinkle half of the chopped cilantro and mint leaves. Next add the layers of rice, cream saffron mixture, and drizzle ghee. Then sprinkle fried cashews, almonds, onions and remaining cilantro, mint leaves. Cover with the lid put the weight on or place aluminum foil between lid and pan. So steam cannot escape. Cook on lowest possible heat for 15-20 minutes.